These vintage planters are in excellent condition and may be used individually or in a stacked configuration. They come with newly made aluminum trays and nine are available. Minimalist and elegant in its design this unusually large articulating floor lamp has a counter weight system that makes it effortless to adjust. Post-Constructivist sconces by the Swiss design and manufacturing company BAG Turgi, 1960s. 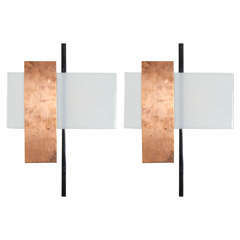 The geometric design is composed of Perspex and copper and steel.